We are having a date! Husband and I are zigzagging through rain-splashy traffic for an afternoon matinee of Julia Sweeney’s one-woman show at the Geffen Playhouse in Westwood Village. It’s dog-eat-dog as he squeezes our little Honda Fit into the long line of cars entering the $4 validated parking lot next to Trader Joe’s. It may be “mellow Sunday” but it’s still a zoo out there and we will do just about anything for cheap parking in Los Angeles. We afternoon revelers take our seats, forming an intimate semi-circle around an empty floor in the middle of the Geffen’s mini-theater room. Well it’s not quite empty. An usher brings a bottle of water and a big cup of something, places them on the stool and arranges the microphone and stand real close to the beverage supply. With no fanfare whatsoever Julia is introduced and bounces into the spotlight wearing a black jogger suit as if she too just dashed over from Trader Joe’s. 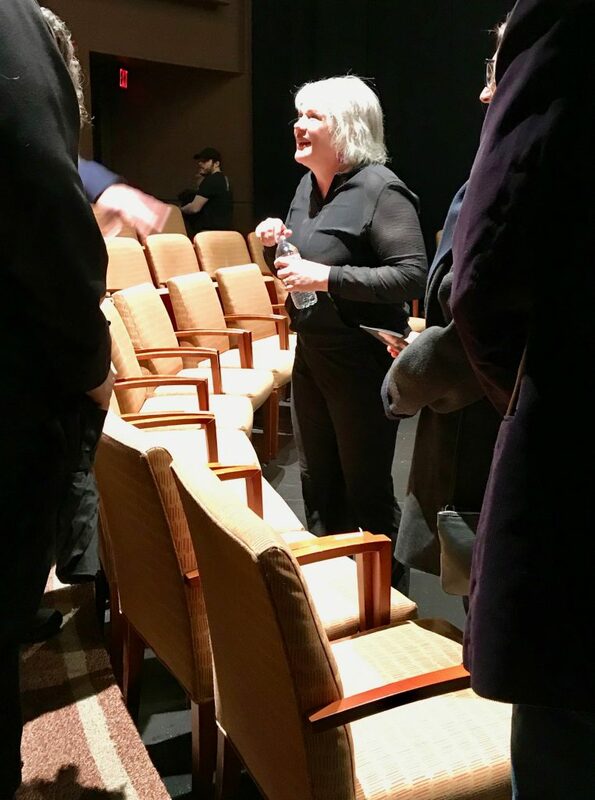 That is why, when Julia Sweeney makes an audience-schmooze appearance after the show, I tell her “you are such a pro.” Because it takes a pro to navigate the vagaries of doing a show, the vagaries of being in show business, the vagaries of just living your life and still grabbing onto an anchor—to something—that keeps you, well, upright. And maybe even smiling. Because you are still breathing, after all. Once upon a time The Geffen was The Westwood Playhouse, standing pretty in the shadow of UCLA, which is right across the street. I flash back to the summer of 1984 where I am the first person in line with my $25 sit-anywhere-you-can-grab-a-seat ticket to see Miss Peggy Lee. I want to be in the front row, center, close enough to see the veins in her eyeballs. She is my favorite singer. Her combo launches into THE signature song as she s-l-o-w-l-y approaches the microphone. It’s delicious torture how she takes her time. She extends her arm towards the audience, starts snapping her fingers and sings, “Never know how much I love you…” Oh wow! This is what COOL looks like. Her platinum hair—a wig probably—is dolloped just so in a perfect pageboy—and she sings that song—Fever— like she’s singing it for the first time. What a pro! Apparently Peggy Lee had a pre-show ritual which included knocking back a shot of cognac and letting lose with a guttural whoop before going on stage. I can only imagine she was doing that before the show I saw in 1984. Then she comes on stage and sings like there is no tomorrow. I remember hearing someone say that the sum of his whole life has brought him to THIS moment and then THIS moment. In other words, THIS is it. 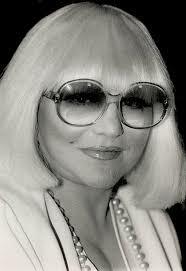 Peggy Lee brought each filament of her life to THIS moment. I could hear it in her songs, see it in her face. 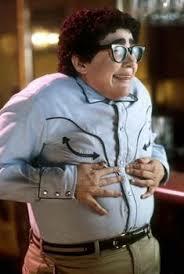 Just as Julia Sweeney does in her show. That’s what singers and actors and comics and writers and artists DO. They hold up a mirror so WE can see ourselves…doing the same thing. SHOWING UP and landing here. Baggage included. I am starting a brand new class: Ukulele For Beginners PLUS. We need a transitional workshop for folks who already play a little but want to feel more confident and learn more goodies on the ukulele. 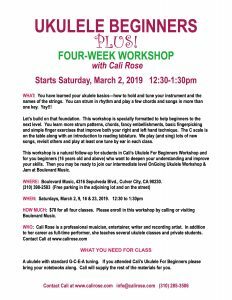 This four-week workshop begins Saturday, March 2, 2019 at Boulevard Music in Culver City. 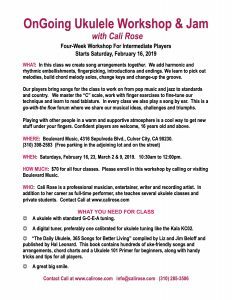 My Four-Week OnGoing Ukulele Workshop & Jam is beginning a new session on Saturday, February 16, 2019 at Boulevard Music. This has morphed into an intermediate level class where we co-create song arrangements and add lots of flash and fun. 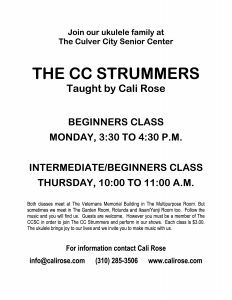 My ukulele group, The CC Strummers, meets twice a week, Monday afternoon and Thursday morning in Culver City. Please CLICK HERE for the details. And thank you all for being there, staying connected and coming along for the ride. i think, around the same time – a year before or after?- i saw peggy lee at a smallish club in century city, in the era when the theater (what was the name?) was just across. i think i saw cats and maybe les miserables there. anyway, i do recall being “taken away”, somewhere else by ms lee’s intoxicating performance . thanks for reminding me. 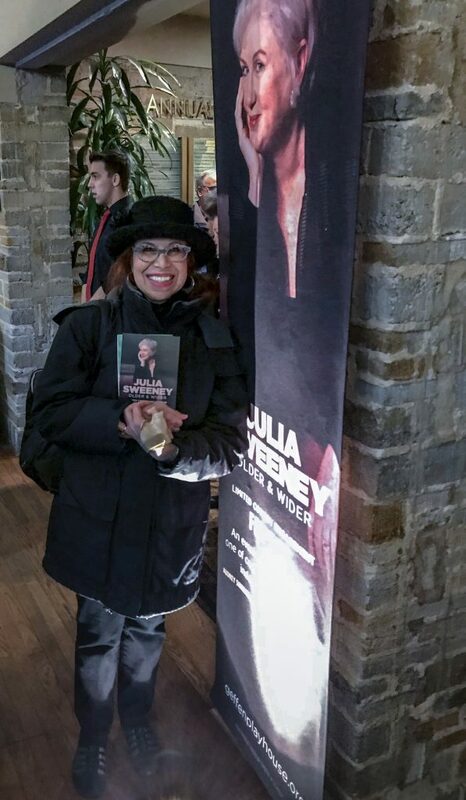 and, julia sweeney live – adding to my “to do” list. and, thank you cali, for sharing your way with words, for me, joyfully- so appreciated. Love the blogs. Keep them coming. Thank you so much Gladys.